As corny as it sounds, I recently wished a friend “a pomegranate week: healthy, vibrant, sweet!” While I’ve long hoped to celebrate their qualities in the form of a new dessert, the pomegranate harvest comes along and I find myself gleefully breaking them open — red splatters and all — and immediately eating every last juicy morsel. But this year I determined to be different: I brought home several extra pomegranates from the market, and a bit of self-discipline to boot. This recipe started with my familiar dream of a fruity, creamy treat (a craving which, by the way, has also had me making multiple batches of this lately). Most recently, I envisioned something with complexity in both texture and taste, and I craved a whole lot of seasonal flavor packed into each bite — so pomegranates would be perfect. Once I settled on making a cheesecake, I decided I wanted to keep it from being too towering or too heavy; it would be compact and crust-free. In its first version, it was served upside-down with the lovely pomegranate arils draped across the top. But a few factors led me elsewhere: first, the arils lost their vibrancy once cooked — while they kept their succulence and crunch, they simply weren’t as pretty anymore. Second, the juiciness of the fruit soaked downward into the cheesecake over a short period of time, with the risk of sogginess casting a murky shadow. Third, I found that the crisp, flavorful arils made an absolutely lovely replacement for traditional crust (and one that’s gluten-free as well). Reaching for orange zest and some pumpkin puree felt like a given, and together they proved to sing of the season. Meanwhile, the molasses-rich sugar and scoop of spices offer a warmth that balances the subtle tartness of both the cream cheese and pomegranate. Preheat the oven to 350 F. In a bowl, toss 1 cup (6 ounces) strained pomegranate arils with the orange zest. Sift granulated sugar and corn starch over the bowl, then toss until all fruit is coated. Transfer to the prepared pan and spread the fruit in an even layer to the edges. Set aside. Remove cheesecake from oven and let cool completely to room temperature on countertop. Place in fridge if not serving soon, or if you prefer your cheesecake cold. When nearing serving time, run a knife around the side of the cheesecake and invert it onto a plate; this can require a hearty whack. Remove and discard the parchment, and re-invert cake onto your serving plate. (Or, if using a springform pan, simply remove the sides of the pan.) Decorate with arils and mint leaves if desired, slice with a sharp knife, and enjoy. This cheesecake tastes best the day it’s baked but can be kept chilled and eaten up to 2-3 days later. With its surprising burst of pomegranate “crust”, this distinctive dessert offers decadence, complexity and seasonal spice. Its notes of molassesy sugar, vibrant orange zest, and rich pumpkin are beautifully balanced with the tang of velvety cream cheese and the crisp bits of pomegranate. Smooth yet crunchy, rich yet bright, this cheesecake is a showcase of scrumptious qualities in a single, simple form. It’s as wondrous for breakfast with tea or coffee as it is a luscious evening treat. Enjoy! 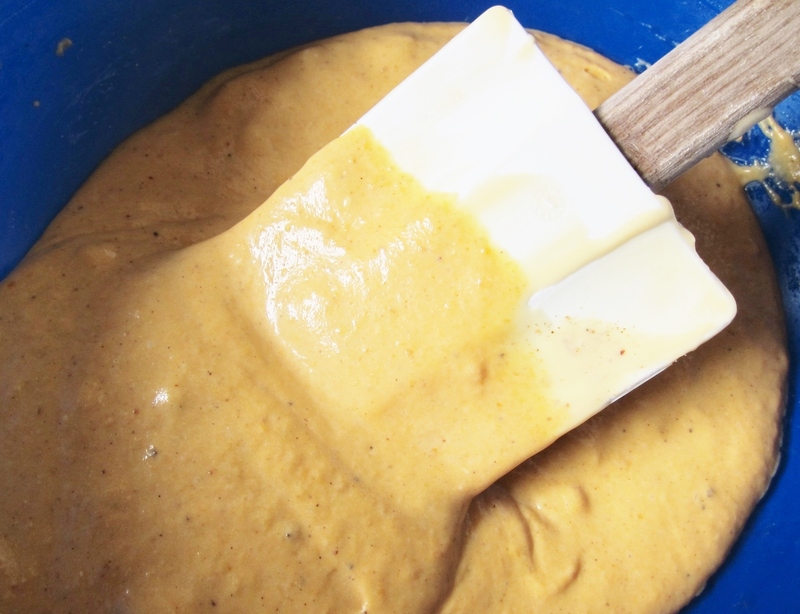 Maybe next time… Using fresh pumpkin (cooked then pureed) would be a great alternative to canned pumpkin, as would butternut squash or sweet potato — just make sure the veggie of choice is not too watery since the juice of the pomegranate is already present. Feel free to play with the spices (cinnamon and cardamom could be particularly nice). Instead of mint leaves and pomegranate arils, a zig-zag of pomegranate jam and a few curls of orange peel would make an equally lovely decoration atop each slice. This entry was posted in Baking with Veggies, Pies, Tarts, Tortes & Cheesecakes, Sweets, Traditional with a Twist and tagged autumn dessert, autumn recipe, baking, cheesecake, citrus, cream cheese, dessert, fall dessert, fall fruit, fall recipe, GF, gluten-free, holiday dessert, holiday recipe, pomegranate, pomegranate cheesecake, pumpkin, pumpkin cheesecake, winter fruit. Bookmark the permalink. I think it’s sweet that you wished a friend a pomegranate week. I’m wishing you one as well! Fruit and chocolate forever! Happy pomegranate week to you, too! 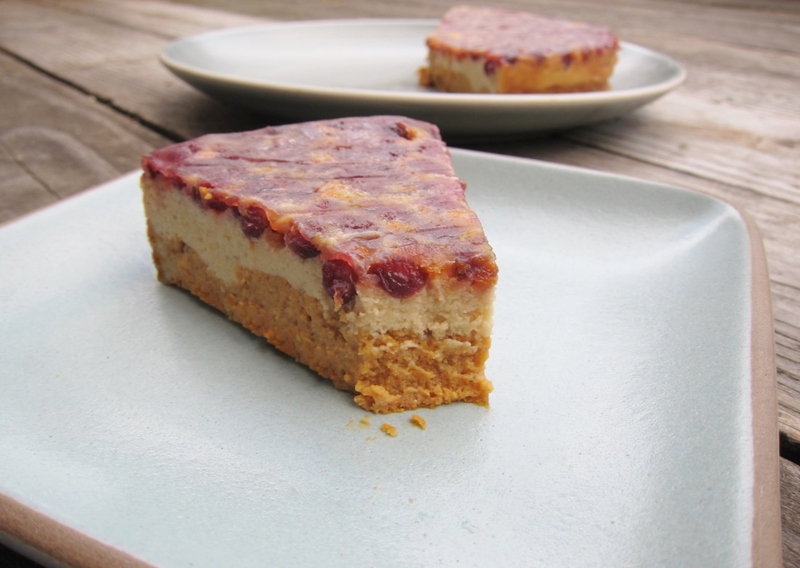 This pumpkin pomegranate cheesecake looks so very beautiful and festive! I adore the way you decorated the top with the mint leaves and the fruit itself. And such beautiful photographs as always too!